I drove up to Providence Monday morning after the Jersey show. 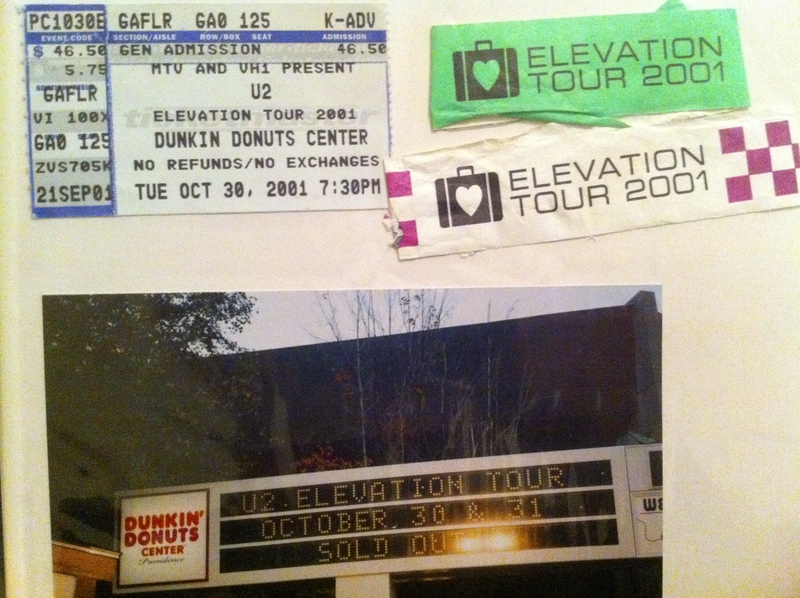 I got in the GA line at Dunkin Donuts Center around 3:30pm the day before the show and was number 12 in line. It was a pretty chill line. I went up to my hotel room around 9pm to eat and watch tv. I went back down to the GA line for a little bit until 11:30 when Gabriella, Alice, Khelia, Ruth and I went back to my room to watch U2 on David Letterman. U2 played New York and Stuck in a Moment, then Bono was interviewed. I slept in my room until about 5:30am and then got back into the GA line. Paola flew in around noon. We hung out in line and then went to the mall for some food. We waited for the band to arrive, but they didn’t arrive until after 6pm. Because of a slow wristband-er, I didn’t quite get the spot at the rail that I wanted. I ended up a bit too far to the right, but I was right in front of Adam. Paola was excited because it was her first time inside the heart up front at the rail. Stereophonics opened. 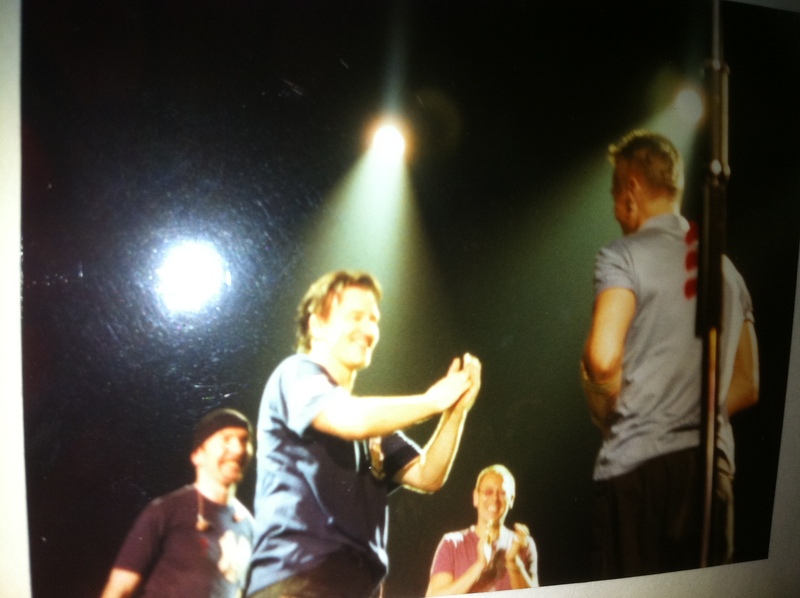 During Out of Control when Bono introduced Larry, I went nuts screaming and jumping up and down. The security guard John motioned to me, then said something to one of the other guards. 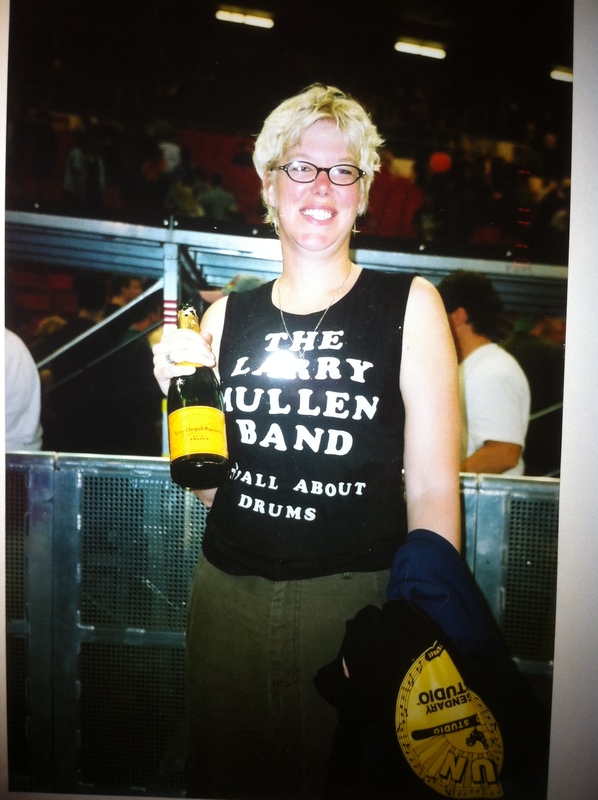 A bit later, John came over to read my shirt – ‘The Larry Mullen Band. 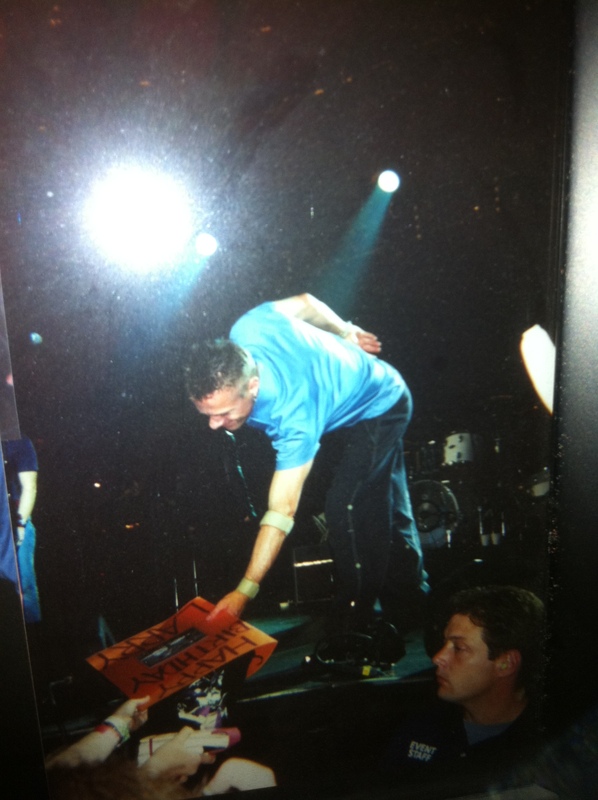 It’s All About Drums.’ He smiled and gave me the set list. 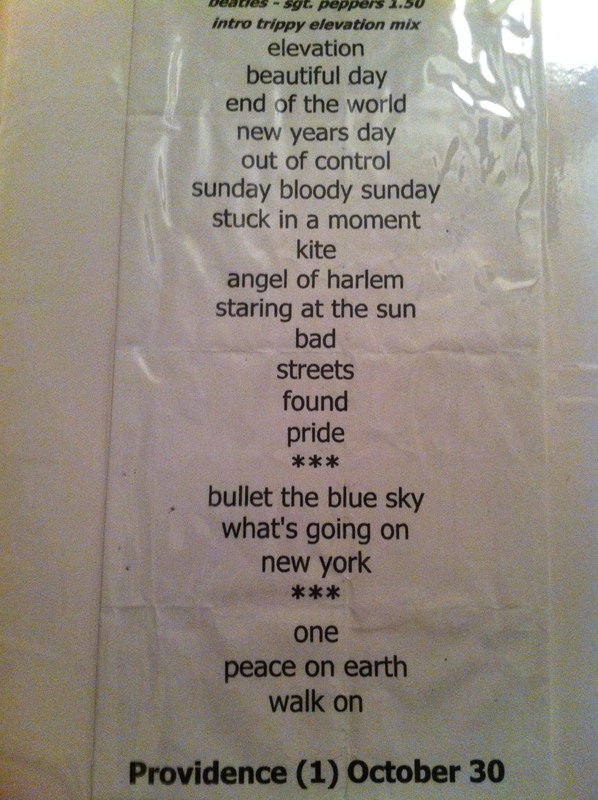 The only difference to this set list was When Will I see You Again was played before Walk On. 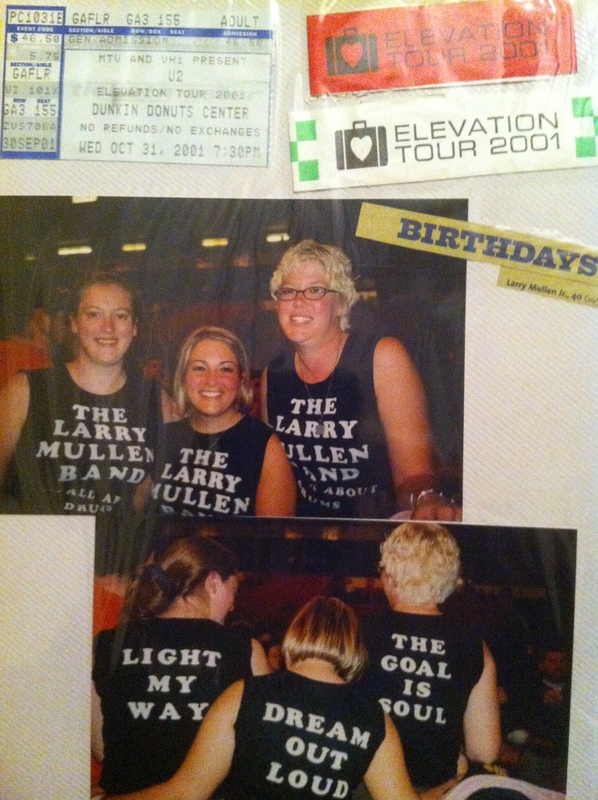 After the show, we got in the GA line for the next night because it was Larry’s 40th Birthday show. I was number 7 in line. Tasha had driven up and met us after the show. We got some food, then Tasha slept in the hotel while Paola and I slept outside in line. After Stuck in a Moment, Larry’s 40th birthday celebration began. We sang Happy Birthday to Larry. 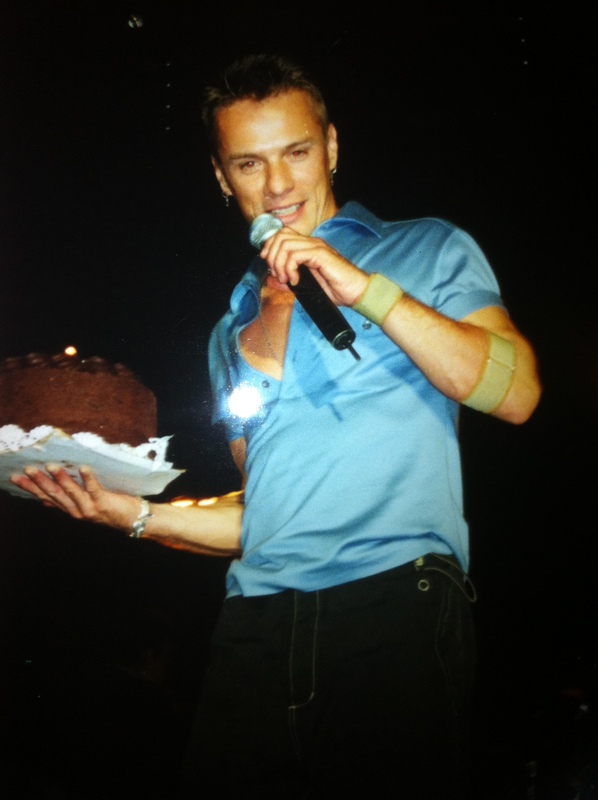 A birthday cake was brought out and Larry pretended to throw it out into the audience. Larry took the mic and came to the front to talk while Bono sat behind the drums. 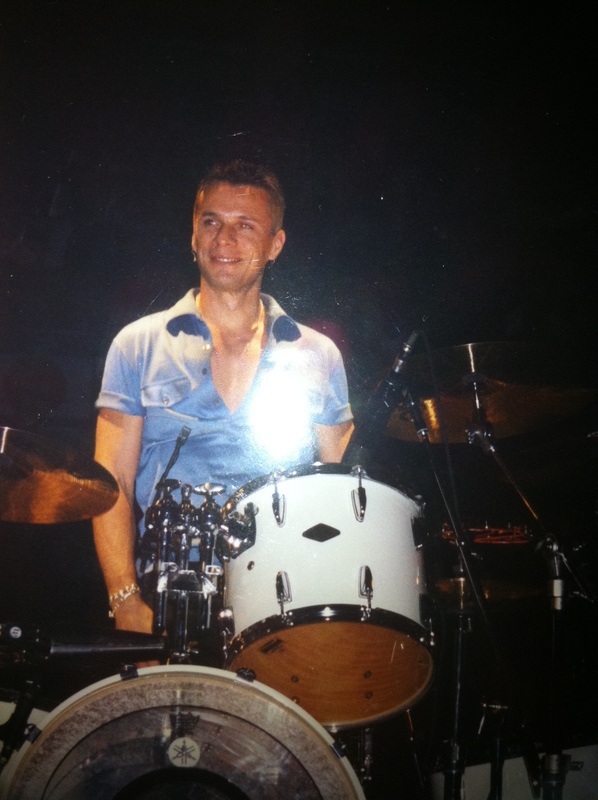 Larry said, ‘Bono couldn’t play drums. It took me 40 years to get up front. I’m glad I’m spending my birthday with 18,000 of my closest friends. I feel like I could borrow money from you.’ Then Bono asked for a bottle of champagne, which he shook up a la ZooTV and sprayed the audience. Edge took a swig, then Larry drank and continued to drink for the next few songs. 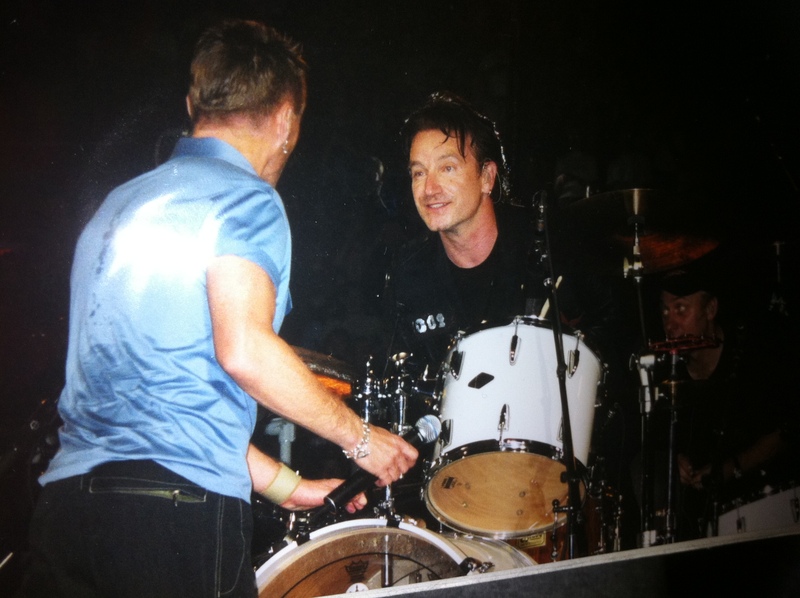 After Kite, Larry got off the drums and made a B line for me. I got my card and shirt in hand so I could give it to him, but that’s not why he was there. He gave me the champagne bottle – with champagne still in it. I drank some and shared it with Paola and Tasha. Larry wanted to share his birthday with ME! He wanted ME to have a drink on his birthday. I was SO excited I didn’t even know they played Wild Honey. I thought it was Staring at the Sun. I didn’t really come around until Please. After Pride, Larry came back over to me so I could give him the birthday card and Elvis tee shirt. I said, ‘Thank you. 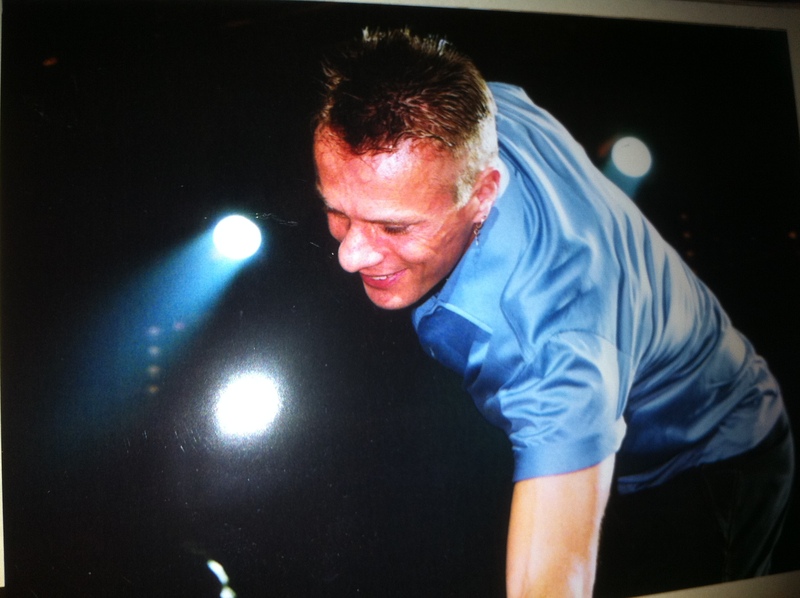 Happy Birthday.’ He smiled and said, ‘Thank You.’ He looked into my eyes, just like he had in Jersey. 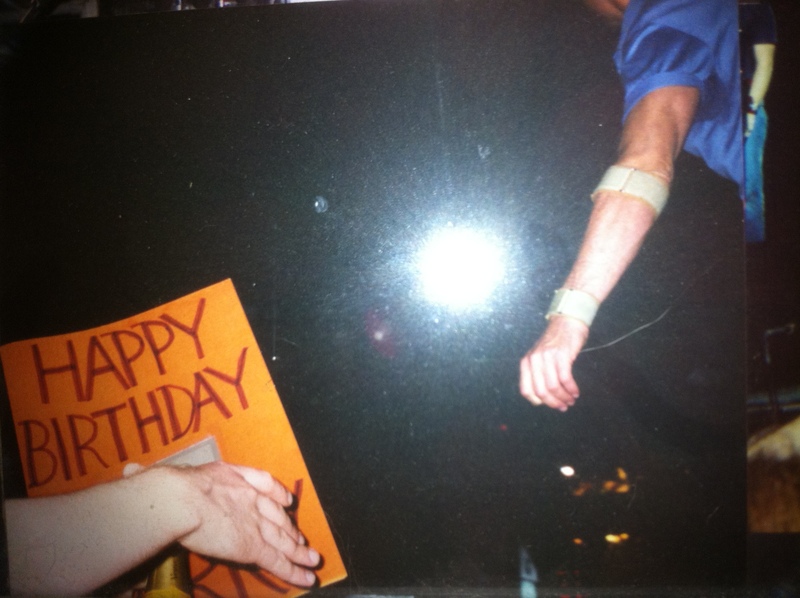 Then Paola gave Larry her Larry scrapbook, which contains the picture of him hugging me. Later on, Bono noticed our shirts, shook his head and smiled. Before leaving the stage Larry took Michelle’s Elvis sunglasses with sideburns and put them on. 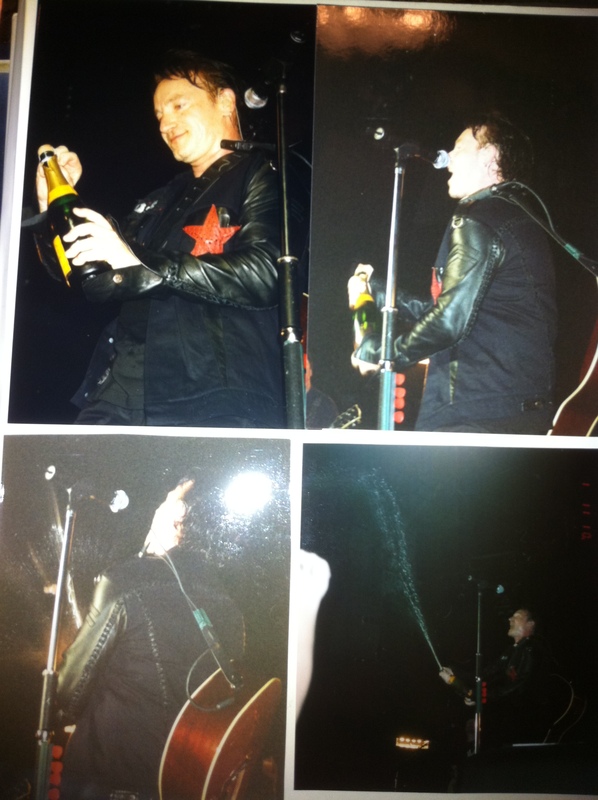 I was so elated after the show – walking around hugging the champagne bottle. 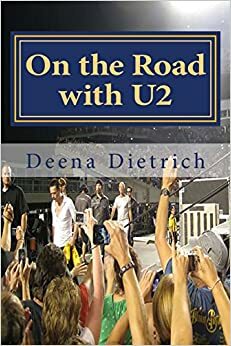 I told my story on video for this women making a U2 GA documentary. I’m sure I made a fool of myself, but I was just VERY excited. Paola, Tasha and I went up to our warm, comfortable hotel room, ordered pizza, watched tv and went to sleep. What an amazing Larry night! 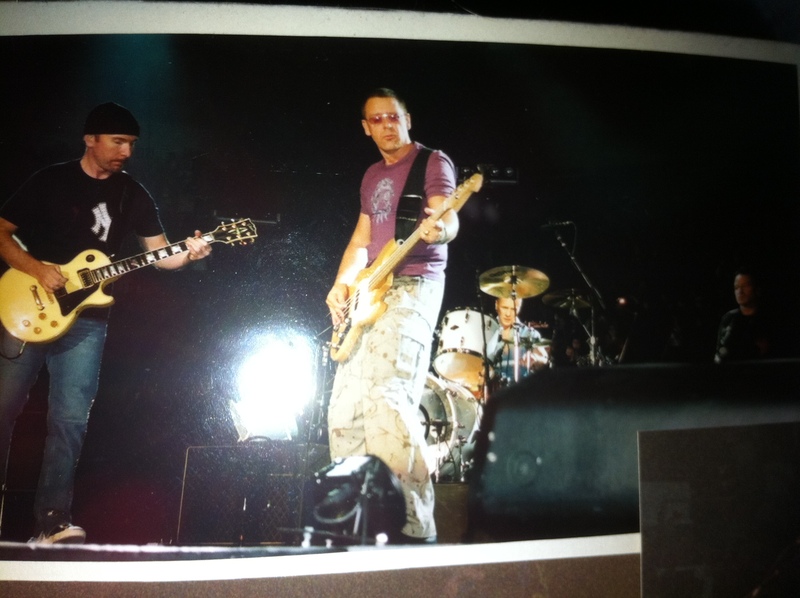 This Providence 2 was my favorite U2 show, not only on the Elevation tour, but favorite U2 show ever. I doubt there will ever be another night like it. Granted it was Larry’s 40th Birthday, and I love Larry. 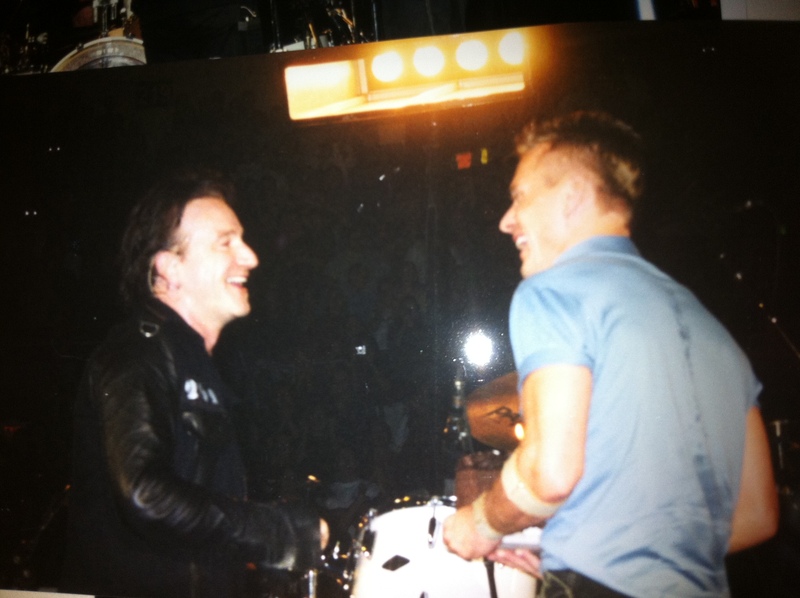 But also for the rarities U2 played that night. Slow Dancing was played for the first time on Elevation, and only the 11th time ever. Party Girl and Wild Honey were played for the first time on that leg of Elevation – and I’ve only heard those songs a couple of times ever. Apparently I was so enamored of my night of Larry moments that I forgot to write about the rare set list in my journal that night. 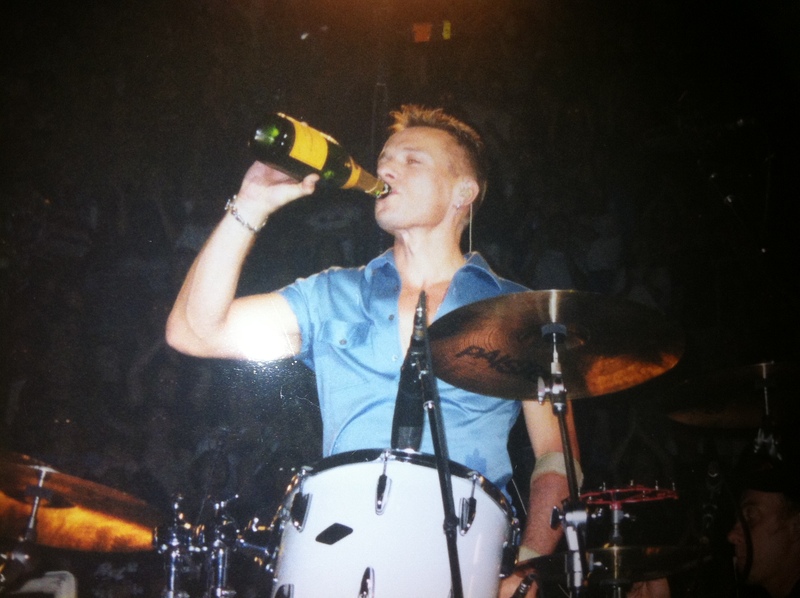 I have still have that champagne bottle on my shelf, along with Larry’s drumstick he gave me in Jersey. 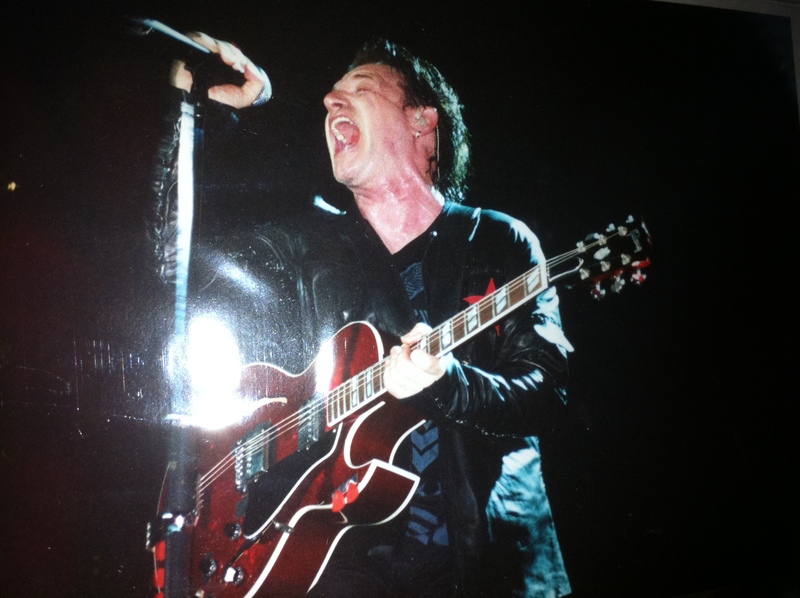 For all your U2 news, please follow me on Twitter @OnTheRoadWithU2.